This ULTRA LUXURY two storey house with 3 bedrooms en suite plus guest house with 1 Bedroom en suite with swimming pool in the Palermo neighborhood is FANTASTIC and AMAZING . 260sqm indoor space plus 139 outdoor space !! Downstairs: It has a central games section with a convertible pool/table-tennis table, and a television area made up of a horse shoe shaped sofa facing a wall mounted 55-inch LED flat screen with DVD player and digital TV. Open plan kitchen fully equipped with dining table with space and settings for 12 people . Guest toilete. Upstairs: The master suite is located at the back of the house with view onto an internal patio; it has “King”-size double bed, TV and Bose IPod/CD/Radio system, large walking wardrobe. The en-suite bathroom features Jacuzzi bath, shower and a large wash area with two sinks. The second bedroom en suite has TV, Queen Size double bed; the third bedroom en suite as well contains 2 Queen Size double beds with room for up to 4 guests. The separate flat at the front of the house is reached by a metal staircase from the pool area. It includes a double bed , TV , a private kitchen and en-suite bathroom with bath/shower. Outdoor argentine style “parrilla” barbecue at the back and a large private outdoor courtyard and decked heated pool area. Other features include an electrically opening garage for one car and an office area on the first floor with desk and printer. The whole house is covered by high-speed wi-fi internet, the bedrooms include the highest quality linen, towels and bathrobes, and all the televisions are connected to local cable with high-definition channels. 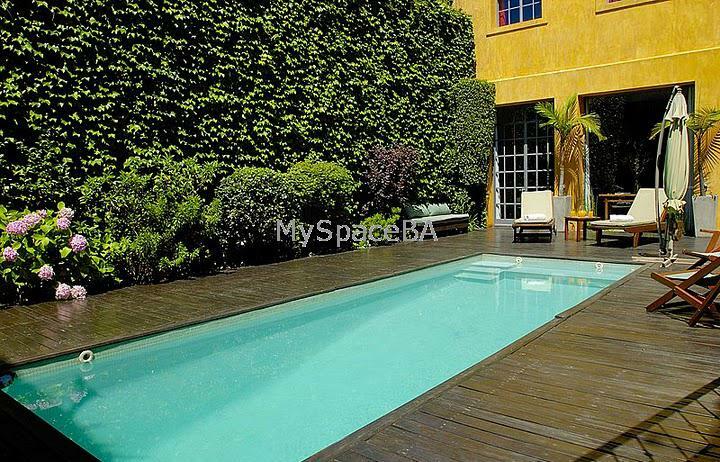 This house has been renovated in a modern, Mediterranean style, with high ceilings and wooden floorboards throughout. Location , Location , location in Palermo close to everything. Included: All utilities are paid by the owner.